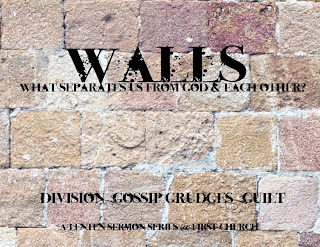 This week I am preaching the second installment of the Lenten sermon series, "Walls: What Separates Us From God & Each Other?" The basic idea behind this series is that we carry around with us all of the building materials that we could ever need to create barriers between ourselves and God--and between ourselves and others. I had to make a decision about the "materials" that I would choose to highlight because we quite literally could spend each Sunday of the year addressing the bricks in our walls and never exhaust the list. 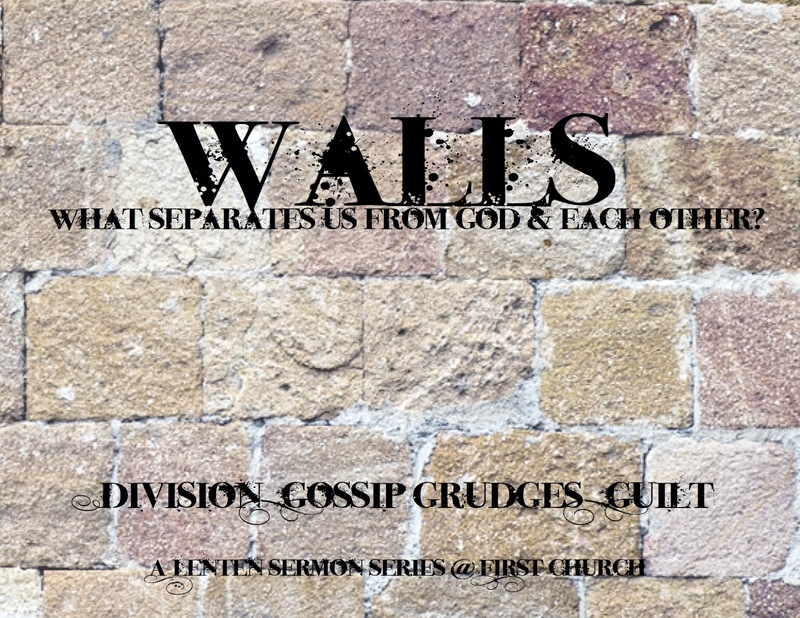 So I thought I would identify what I saw as the most prominent "wall building materials" within the Church: Division, Gossip, Grudges & Guilt. This week we're dealing with Gossip. First, let me ask this very important question which will be at the heart of our study: Words kill, and words heal... Which words are we using? I have to confess that this question haunted me all week. I learned in seminary that the Old Testament command "Thou shalt not kill" inferred the use of words as well as deeds. The ancient Hebrew people knew that there was a kind of murder that could be perpetrated through speech alone. I know that there lots of moments when I make the decision to use words that kill rather than heal. I've been so angry at someone or a group of someone's that I will use speech that dehumanizes them, and denies that they are created in God's image. And what are we without God's image? Dead, that's what. Spiritually dead. Gossip kills simply because it's deadly speech that dehumanizes and denies God's image in others. Preachers like to preach at other people about their deadly speech, but we seldom turn our attentions to ourselves. This has been one of those weeks when I have had to do some repenting of my own, and that's not always my favorite thing to do. I heard a joke about three preachers who were out fishing together. They decided to confess their deepest sins to each other, just to get them off their chests. One confessed that he enjoyed going to the beach, putting on dark glasses and watching all of the girls walk by in their bikinis. The second preacher confessed that he often disguised himself and went to the local horse racing track where he placed numerous bets. The third preacher paused a moment and then said, "Brothers, please pray for me---I am horribly addicted to gossip." Proverbs 18:8 says this: "The words of a gossip are like choice morsels; they go down to a man's inmost parts." Interesting. What this little nugget is trying to convey is that gossip can be as pleasant as words of wisdom. They can be delivered in a sweet package that goes down just as a smooth as ice cream. They cause dissension, though, and before you know it you've digested them and they have become a part of you and so live on. And sometimes words of gossip get into our guts and they poison us. This young girl was gossiped about, cyber bullied and ridiculed by classmates to the point that she finally took her own life out of desperation. This is a dramatic illustration of how killing words... kill. Phoebe was dehumanized and diminished---murdered spiritually---and felt in the end that she had no hope. Someone might be saying at this point, "But that's different... Christians don't go that far." I'm pretty sure that most of us who call ourselves Christians do things like gossip, ridicule, mock and malign others all the time. We constantly dehumanize, and "kill" people with our speech. And every passage of Scripture that applies to these things we think is for someone else. In Romans 1:29-32, the Apostle Paul offers a whole list of things that he warned the early Church to avoid. You can read the passage here. A Gossip ignores God. A Gossip puts himself at the center of his life. A Gossip is like a murderer. The Greek word psithunistes is what's used here for "gossip." It literally means "someone who whispers slander." Paul lists slander in his little list of vices, but he means for his readers to understand that a "gossip" is worse than a slanderer. At least a slanderer is someone who is open about their lies when they are intent on harming someone with their speech. A Gossip doesn't care enough about the person they are wounding to worry if they are hurt or not. They are the secret whisperer who delights in destroying reputations. And what does Paul say about these kinds of people... what do they deserve? Oh yeah. Death. Right about now someone might be saying, "But I'm different... I'm a Christian." Christians are the worst when it comes to gossip, because we hide behind our pseudo-spirituality and try to make our gossiping sound like it's not really gossip. James 3:10 says this, "Out of the same mouth come praise and cursing. My brothers and sisters, this should not be." Several years ago in Australia there was an epidemic among Tasmanian Devils---you know, the real ones. The epidemic was actually face cancer and it was called Devil Facial Tumor Disease. It was discovered that the devils were giving this cancer to each other by fighting over food. They would bite each other in the face when they were trying to eat, and bits of tumor from diseased devils would wind up in the wounds of the non-diseased ones. They would then contract the cancer. Sometimes I think this is how church people treat each other. What are we doing? What are we doing to the Church? I don't want to hear gossip about what is going on in your church. I don't want to sit at a lunch counter in the local diner and hear you blabbering on in my ear about which person is sleeping with who behind who's back, or which woman can't get pregnant, or which person was seen at the Casino last week and who saw them there, or who got caught DUI. How on Earth can you build a Christ like community when you sit around and gossip. How can you be like your Lord and Savior when you get together at work on break or at the salon or the mall food court and dish on all your fellow congregation members... or anybody else. I am not a Christian, nor do I play one on the internet... so I am just throwing this out there to those of you who are. Let that sink in. This person was not a Christian. And probably now will never want to become one. Words kill, and words heal. Which words are we using? Rabbi Joseph Telushkin, the author of Words that Hurt, Words that Heal asked a group of people at a conference if they thought they had gone one day without saying something bad about someone that week. Hardly anyone raised their hand. He told the group, that if they had admitted that they had not gone a day in the week without getting drunk or taking drugs, he would tell them they had an addiction. Here's the thing... we have a choice with each moment that we are given to decide whether we are going to live that moment either with or without God. Most of us decide to live our moments without God because we want to be in control. But what if a bunch of gossipy Christians decided to give all their moments to God. They would be on the road to recovery, wouldn't they? A Recovering Gossip desires God. A Recovering Gossip wants God at the center of his life. A Recovering Gossip wants to heal with words. Words kill, and words heal. Which words will you use?